Currently on view at IS Projects is a new, politically charged series of paintings by Kelcie McQuaid. Walking in Circles addresses the heroism of taking to one's feet in pursuit of change, and the redundancy of the conflicts which arise when we advocate for civil rights and social justice. Using images from past historic American protests and movements, the exhibition takes aim at the denial of cruelty, injustice, and brutality which has taken center stage in this election cycle. The reference images which McQuaid has selected for this series bear a striking resemblance to images of present-day protests, and were the product of similar cruelties. Throughout her career, Kelcie McQuaid has used painting to process her own perspectives and experiences, but for Walking in Circles, she has chosen to use painting to ruminate on other stories of struggle, and how they intersect. McQuaid delivers stark, emotive figures on candy-colored grounds. The paintings are strategically palatable, charming viewers into approaching her work, and holding them with her direct and deliberate illustrations, in order to render her subjects relatable, relevant, and human. In conjunction with her exhibition, we collaborated with Kelcie McQuaid to produce our first print publishing project. 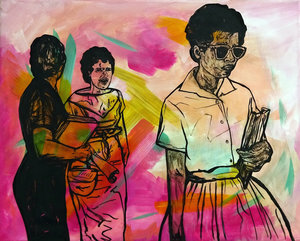 The edition of fifteen silkscreen watercolor monoprints, entitled “Stay Nasty,” is also McQuaid’s first foray into printmaking. The prints are available for purchase through the IS Projects shop. Kelcie McQuaid is a painter and arts advocate who has built her career in Broward County. She was named the New Times’ of Broward-Palm Beach 2015 Best Emerging Artist. She has been exhibiting her work since 2010, with recent solo shows in venues such as Jump The Shark (formerly The Bubble) and Two& in Fort Lauderdale, and has murals on view at C&I Studio’s Garden and Howley’s Restaurant in Lake Worth. 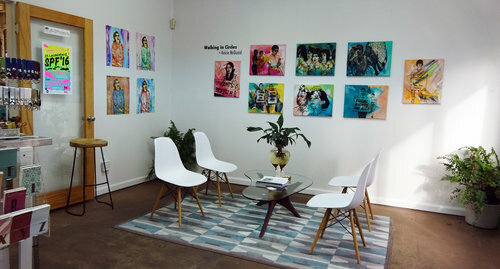 McQuaid has also focused on creating opportunities for other artists in Broward, Palm Beach, and Miami Dade counties through her curatorial work and her history of involvement with organizations like the Broward County Cultural Division, IWAN (Independent Working Artist Network), and Flagler Village’s Arts Districts.